Training magazine taps 2016 Training Top 125 winners and Top 10 Hall of Famers to provide their learning and development best practices in each issue. Here, we look at cultural and system integration at Tenaris, employment brand definition at Vi, and peer advantage at Vistage Worldwide. How can you integrate 20 cultures into one? Tenaris is a global industrial company that has grown through acquisitions and become a leader in its sector: the supply of tubes and services for the world’s energy industry. From a Human Resources point of view, our challenge was crystal clear: We needed to integrate those 20 different cultures while preserving their local particularities. Formally born in 2002 as a group of companies with different histories, cultures, and languages, Tenaris acquired plants and built green field projects throughout the world, including plants and service centers in Canada, the U.S., Mexico, Colombia, Brazil, Argentina, the UK, Denmark, Romania, Kazakhstan, Italy, Nigeria, Saudi Arabia, Japan, Thailand, China, and Indonesia, and commercial offices in more than 40 countries. While creating a single global organization has been crucial in every area of our work, it was even more crucial to standardize the work of hourly employees in our mills. At the beginning, our Human Resources team focused on the processes and policies for salaried employees, because—as many companies do—the hourly staff was considered regional and, thus, covered by local regulations, unions, and law, which supposedly prevented us from designing and implementing a global policy. That was the first myth we challenged. To strengthen Tenaris’ role as a global leader, we need to make sure our products look and perform exactly the same no matter where they are manufactured. This drive led to the creation in 2008 of a global project called 00100, which stands for 0 accidents, 0 defects, 100 percent compliance. The goal of the project was simple yet ambitious: to standardize our industrial process in all our mills. This was the first major step we took toward making one single Tenaris industrial system, worldwide. The 00100 Project could only succeed if we placed an important focus on our people on the shop floor, both hourly personnel and shift leaders. To support this initiative, Tenaris simultaneously launched the “Technical Training Project,” with the goal of achieving objectives centered on our people and the way they worked in six main axes: Organization, Training, Development, Talent Attraction, Compensation, and IT Platforms. Each of these axes has unique characteristics. In Organization, we needed to improve the process organization structure, reducing 10,000 job descriptions to just 450. We wrote detailed job descriptions, divided according to the process and to five different levels of complexity—considering Level 1 the less complex jobs and Level 5 the jobs with high impact in quality, safety, productivity, and compliance. And we also defined the competencies needed to fill each of those jobs. In Training, once we had defined the competencies each job required, we designed the core courses in nine different languages spoken by our employees around the world. The courses included classroom training, workshops, and on-the-job training. Each included a coursebook, instructor’s presentation, instructor’s guide, workbook, and exams. Today, each job requires a minimum mandatory training. And most of the workers already have formalized them to hold their positions. There is also specific and managerial training that can be done once the person fills the new position. By offering customized training, hourly employees are able to enhance their skills and knowledge and seek advancement in more complex positions. In Development, we introduced these career paths to hourly employees as an avenue to grow within the company. Once a year, hourly workers now undergo a performance evaluation that contributes to building those careers as it impacts development actions and compensation. A periodical opinion survey was introduced—already covering 70 percent of the regions—to collect feedback about the work environment, people motivation, and engagement. Talent Attraction defined the ideal global employee profile and also was changed to make recruitment tests and resumes entirely digital. When it comes to Compensation, we designed a model that seeks to encourage behavioral changes and reward merit, while at the same time keeping an eye on market competitiveness and internal fairness. We already have implemented this model in four countries. Closely associated with all these changes, we needed to develop Platforms capable of including the hourly workforce in the systems we currently use to manage the HR process (SAP, Learning Management System, Talent Attraction System, Performance Management System, etc.). On paper, it looked easier than it was in real life. Our target population when we started the project in 2008 consisted of 17,000 hourly employees and 1,200 shift leaders. In order to move ahead with the Technical Training Project, a motivated team integrated by global and regional experts had to tackle several truisms that at first glance seemed insurmountable. The hourly workforce traditionally was managed through local Human Resources processes only. We, on the contrary, believed that incorporating global best practices could add real value to the flow. Some results proved us right. The project led to the detailed description of 450 jobs to cover the 10,000 positions and the training required to fill each job. A total of 400 high-impact courses were designed in nine different languages. As a result of the project, more than 50 career paths were developed. One hundred percent of our newcomers received a common orientation; 12,400 hourly employees underwent on-the-job training; and 13,000 employees now are evaluated every year. Tenaris’ training index doubled. We also expanded the opinion survey to include hourly employees in several regions: Nigeria, Romania, Colombia, Brazil, the UK, China, Arabia, Italy, the U.S., Canada, Indonesia, and Japan. All these actions materialized in concrete results that are crucial for our business. We also consolidated a department called HR for Industrial Areas. Tenaris has placed safety as its top value. In the last four years, the company reduced major accidents in its mills by 80 percent,increased compliance to 94 percent, and substantially reduced the rate of rejection (defects) in its products. The project reinforces the value an integrated HR system can offer on a global level: Our customers know Tenaris has a single industrial identity, in every country and at every plant. And our employees have benefited from a Human Resources system that is simple, comprehensible, transparent, impartial, and capable of bolstering their development and employment conditions. High levels of employee retention have helped Vi, a national developer, owner, and manager of luxury retirement communities across the U.S., maintain strong resident satisfaction and quality care for the organization’s more than 4,000 residents. While Vi enjoys low employee attrition, the company competes heavily for health-care and hospitality talent. In fact, in half of the markets Vi serves, unemployment is consistently lower than the national average. Although Vi operates luxury residential retirement communities in desirable locations across the U.S., at the end of the day, Vi’s employees differentiate the company’s brand in the marketplace. Attracting and retaining high-caliber talent, therefore, is a high priority for Vi. Organizations that prioritize employer brand are 250 percent more likely to rate their overall talent acquisition efforts as highly effective. Organizations that prioritize employer brand are 185 percent more likely to have at least a high-level talent acquisition strategy in place. Organizations that prioritize employer brand are 130 percent more likely to see increases in employee engagement. Only 17 percent of the 2,500 organizations Deloitte surveyed felt they had a compelling and engaging employment brand. 75 percent of organizations surveyed were struggling to attract and recruit the top people they need. In the effort to create greater employer brand awareness in the markets Vi serves, and to support attracting top talent, in 2015, the company embarked on a journey to better define Vi’s key employment differentiators with the end game of launching a new employment brand. Over the years, Vi has invested heavily in a talent development strategy that has yielded award-winning training, along with high levels of employee satisfaction with the organization’s commitment to employee development and internal growth opportunities. The deliberate focus on employee development is now an employment differentiator that helps the company retain talent. While attrition in the senior living industry can range anywhere from 35 to 75 percent, Vi has been able to maintain attrition in the low 20s percentile. Likewise, at many of Vi’s locations, positions filled internally are as high as 30 percent. Vi’s Management Development Program, Breakthrough Leadership Program, and company-paid certification programs all have been key drivers that have contributed to high levels of employee retention and internal programs. Data from Vi’s last employee survey demonstrates how employees view training they receive to do their job well, and how training contributes to individuals achieving their personal career objectives. Employees ranked training to do their job well 21 percent higher than the U.S. norm compared to 11 percent from the last employee survey. Employees ranked the training new hires receive 24 per- cent higher than the U.S. norm compared to 17 percent from the last employee survey. Employees ranked the ability to achieve their personal career objectives 15 percent higher than the industry and 10 percent higher than high-performing companies. As Vi focused on developing a new employment branding campaign, it became clear from the results of Vi’s employee engagement and new hire surveys that the company’s strong commitment and investments in employee development were key employment differentiators. More importantly, Vi realized there was an enormous opportunity to highlight the many employee success stories to build a compelling employment branding campaign. Vi leveraged the expertise of Chicago-based agency Shaker Recruitment Advertising & Communications to develop a more refined employment brand campaign that clearly articulated the company’s Employer Value Proposition (EVP). An employment brand—or any brand for that matter—is more than a catchy tagline, a series of pretty pictures on an ad, or a slick Website. A brand expression—whether it’s a recruitment site, ad, or the candidate experience—must capture the essence of a company’s culture. It must be genuine and honest and connect emotionally with the candidate. The execution of a brand must be consistent and aligned with an organization’s core values and mission. Done well, regardless of the employment brand touchpoints, any candidate should be able to clearly articulate an organization’s value proposition. 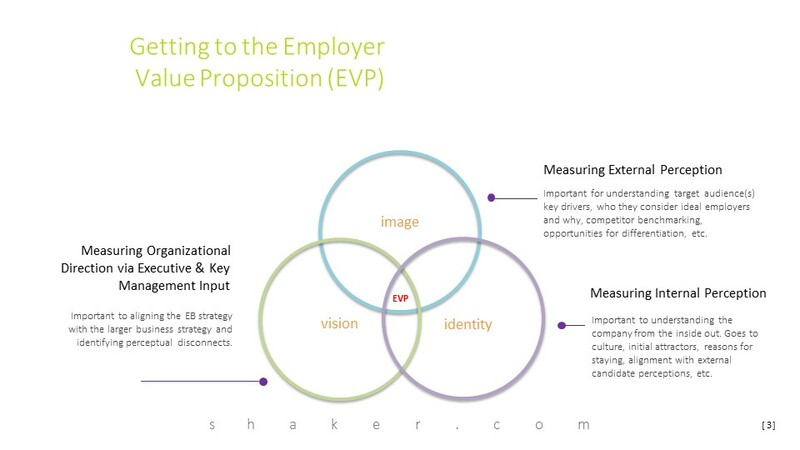 Vi realized with the help of Shaker that there was a tremendous opportunity to leverage the many employee development success stories to bring life to the company’s new employment brand strategy. “Bring Life to Your Career” In early 2016, Vi celebrated the launch of the company’s new employment branding campaign, “Bring Life to Your Career,” featuring employees who have successfully taken advantage of the organization’s many training and development opportunities to enhance or expand their careers. An important and added benefit of the new employment brand is that Vi’s employees are highlighted and recognized for their accomplishments and contributions to the organization. Vi’s new employment branding campaign included the relaunch of the company’s career site, employee referral campaign, recruitment materials, social media strategies, and internal employee communication channels. 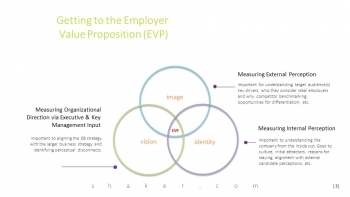 “Vi’s employment brand is an invitation to imagine,” Shaker says. “The brushstrokes art style suggests and builds the story aspect with actual progression of how people came up through the organization with the support of continuing education. At its most fundamental level, Vi is about opportunity. The branding encourages candidates to dream, to imagine,” he adds. While Vi’s new employment branding launched in March, and it’s too early to measure results, robust analytics tied to Vi’s new recruitment site allow it to evaluate what specific areas of the company’s career site resonate with candidates. In addition, Vi recently updated the organization’s third-party new hire survey to assess what specifically resonated with candidates during their decision to accept employment with the company. This data will allow Vi to continually refine the candidate experience and branding messaging. By Michael Molina, Chief Human Resource Officer, Vistage Worldwide, Inc.
Far from a buzzword, “employee engagement” is a metric no business can afford to ignore in 2016. For confirmation, just look at the latest findings from the Gallup Organization, which has tracked employee engagement in the U.S. since 2000. Though there have been slight ups and downs, less than one-third of America’s workforce is engaged in their jobs. Look around the world, and the numbers get worse—just 13 percent of employees are engaged. Not only that, Gallup estimates lost productivity of actively disengaged employees costs the U.S. economy $370 billion annually. So why are employees so disengaged from their jobs? At Vistage Worldwide, which facilitates private peer advisory groups for CEOs, senior executives, and business leaders, we are looking for answers. When I think of engagement, I almost equal that to employee experience. It’s the support and connection I get within the organization, the level of meaningful work, having a mentor or guide within the organization—all of those factors are so important. Select the right people to participate. Then we create peer groups where vulnerability and authenticity can be experienced. Create a safe environment. For me, this means employees are connected to their work with an infrastructure that is supportive and conveys clear outcomes. Employees can see how their roles fit into the bigger picture. Utilize a “Smart Guide.” This person could be a manager, an influencer, a pal, or a role model. Direct managers typically aren’t encouraged to play this role because of the value placed on getting alternative points of view. Foster valuable interaction. To achieve this, a safe environment that encourages a high level of contribution is critical. A collaborative work style raises the level of engagement and creates deeper, more meaningful interactions. Be accountable. Vistage employees own their solutions, and it’s expected they do what they say they’re going to do. Authenticity is one of our cultural imperatives. These principles are further explored in the new book, “THE POWER OF PEERS: How the Company You Keep Drives Leadership, Growth, & Success” (http://www.vistage.com/thepower-of-peers-overview) by former Vistage CEO Leon Shapiro and Leo Bottary, vice president of Peer Advantage for the company. Not only are they fundamental in selecting talent to work at Vistage, but in finding new speakers (at every monthly meeting, half of the day is dedicated to an expert speaker), as well as in selecting “Chairs” or the leaders of the peer advisory groups who are schooled in the Vistage process. Ultimately, these are the building blocks for a strong community. Employers and potential employees are equally responsible for making sure a position is a solid fit. But beyond the getting-to-know-you process, it’s a company’s style of management and values that dictate whether an employee ends up satisfied and engaged or simply a “clock-watcher” going through the motions. At Vistage, this is when “community” gets real by translating into results-driven strategies that set up workers for success. These strategies involve things such as active listening, up-front collaboration, feedback during early stages, ask before tell, multiple touchpoints in decision-making, and presenting options instead of single solutions or recommendations. And the goals are clear: to deliver value to the members and generate the highest level of engagement by employees and Chairs. When HR consulting firm Towers Watson completed a recent global workforce study, one of the five key findings was that “the organization is the most powerful influencer of employee engagement.” At Vistage, organizational structure, practices, and processes are designed for staff to continually evaluate how their roles and work fit within the larger context or vision of what the firm is working to achieve and whether that connection is profound enough to result in long-term retention. In any relationship, the level of care that goes in will determine its success. In the work world, this translates to how big of an investment the company makes in its employees’ ongoing development. This is a huge component in the Vistage experience. Again, replicating what it does for CEOs and business owners with its internal teams, every employee gets to experience the benefits of working with a peer group to solve problems and process issues once a quarter. Being vulnerable in that peer experience is so important because employees are able to adapt a mindset of improvement, of learning. They are able to open up and see possibilities—to see the world through a different lens.